I’ve never won a footrace. Not in High School, not in Middle School, Elementary School or Summer Camp. At least not that I remember. But Thursday night that changed. 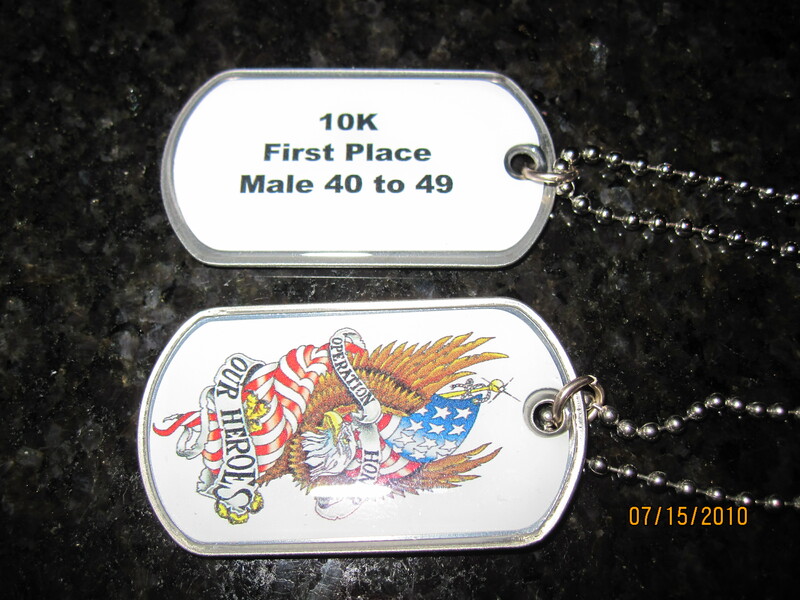 With a time of 41:06 on a hot 92 degree night here in Austin, TX – I won the Overall Men’s Honor our Heroes 10K race. Now this was not the Capitol 10K with more than 40,000 runners or anything, but it was a pretty special event and for an incredible cause. This 10K race was held in honor of the fallen soldiers from the Central TX area who lost their lives in service to their country. 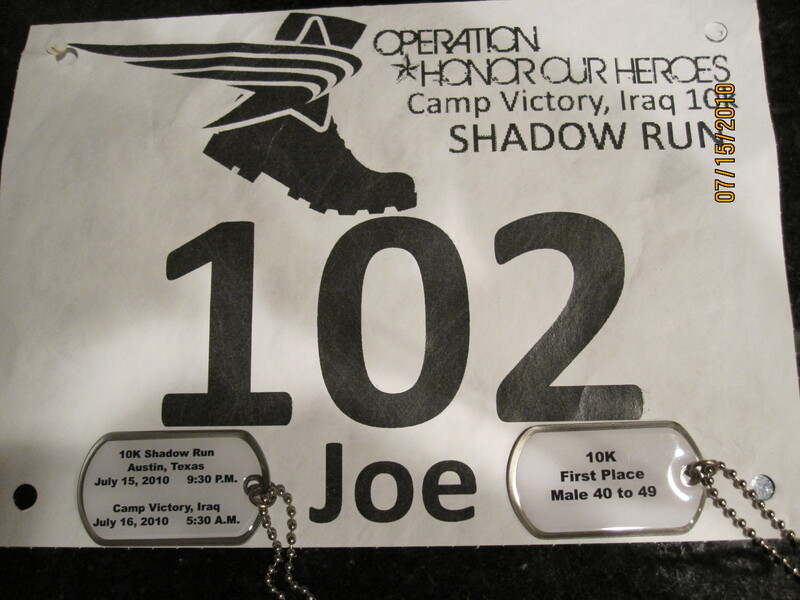 Money raised from the race supports the families of those fallen soldiers to help make their lives a bit easier. The race was held at 9:30 p.m. local time so that it could be run simultaneously with more than 500 soldiers from Ft. Bragg here in Austin who are serving at Camp Victory in Iraq. They were running at what was for them 5:30 a.m. halfway around the world. As we were getting ready to start the race we gathered on the local football field and could see and hear the soldiers in Iraq on the jumbo-tron. This being TX and all, where High School Football is kind of a big deal if you haven’t heard, the local stadium is pretty darn impressive I must say. One lucky soldier was even able to say hello to his wife over the sattelite feed who was running with us. It was pretty special. Af ter the Star Spangled Banner we all toed the goal line and would run under the goalpost, through the starting chute and out of the football stadium onto a loop course. The 5K runners would loop the course twice, the 10K runners would go around four times. Being my first attempt at the 10K distance, I really was not too sure how to pace myself – I knew from my 5K times this summer, that getting out fast was going to be important. I decided to stay behind the pace cart and turn in a mile about :15 seconds slower than my pace for the first mile of a 5K. Something between 6:20 and 6:25. I would see how I felt at that point and try to fall into a smooth rhythm. I knew that with 92 degree temperatures – tonight would not be my night to post that sub 40:00 minute time – but if I could run in the 41:30 range – I felt like that would be a good effort. I clicked off the first mile at 6:21 pace and was running directly behind the cart that was leading us around the course. I had three runners on my shoulder, a man about my age and two Former Marines based on their T-Shirts. Somehow I knew that I should be more intimidated by their T-shirts than my Marathon Maniacs singlet intimidated them. I slowed down the pace just a bit to the 6:30 range and decided that is where I would try to hold the middle miles 2,3 and 4. I fell into a steady groove as I began lapping 10K and 5K runners and clicked off miles of 6:28, 6:31, 6:34. As I began the final loop of the course at the 4.65 mile mark I realized that I had been running alone for the better part of the last mile. I glanced over my shoulder and I had opened up a considerable margin over the runners behind me. Then I saw the three of the runners who had been chasing me looping past me coming in the wrong direction. It didn’t make sense to me at first until I saw the look on the first runner’s face. When they lost sight of me they had made a wrong turn on the course, cutting off close to one-half of a mile. Now I was really all alone, trying to dig deep and push to the finish. I was confident that the times and placing would be sorted out at the end, but now unfortunately I had nobody behind to push me. I felt myself slowing a bit and I tried to hold pace. Over the last mile I lengthened my stride again to see how hard I could push and try to determine if I had paced myself properly or if I could have gone out a bit faster. I felt remarkably strong over the final 1/2 mile and the experience was truly surreal. I was leading a race over the final meters and would actually “win”. As I crushed through the finishing chute I saw the clock tick just over 41:00 and register at 41:06. 66 seconds off of my goal for this Fall, but :24 seconds faster than my goal for this race. As I pulled my earbuds down, I heard the men who I had been racing with saying to the race director, “there’s your winner, there’s your winner right there, 102. Number 102”. I walked out to mid-field of the football stadium and began chatting with the runners. William and Mark were awesome and apologized over and over for the error on the course. I told them that it was no big deal and that they were really crushing out there. But their “9.2 K” finish time was showing them at a pace around 6:22 which they knew was not correct. William remarked he was running 6:50’s on the course. After talking with the official timers and the Race Director everything was sorted out. It was true. I had actually won the men’s overall 10K. I’ve said many times that racing for me is really a way for me to determine how I stack up to the only runner that I’m really competing with – Me. There are always going to be runners out there who are younger, stronger and faster. I’m more concerned with how well I perform vs. my own goals than how well I do against others. The thing I think I’ll remember most about tonight was the camaraderie and the feeling that we were all out there running for the right reason – to honor those who serve our country with great bravery and commitment. Seeing the families of the soldiers in Iraq at the race was truly inspiring. It is an event that I hope they do again later this summer as I will certainly be there unless Little Miss Landry or Dawn need me at home. That said, deep down I would be kidding myself if I didn’t admit – winning was kind of nice too …. Heck yeah winning is nice! And it feels good to “know” the winner. Especially of a race with such a cool theme and to run it alongside soldiears in Iraq! Outstanding performance Joe! Very impressive job and for an awesome cause…even better. Keep inspiring!! Great race recap! There’s nothing like finishing a race and knowing you left everything you had on the course… and, well, doing that AND winning must be even better. Way to go, Joe! R- Thanks so much for the visit and the message! You are exactly right, there is no better feeling than racing hard and smart and surpassing your goals and expectations. Makes all of those solo-mission training runs worthwhile. Warrior Dash …. Losing it?